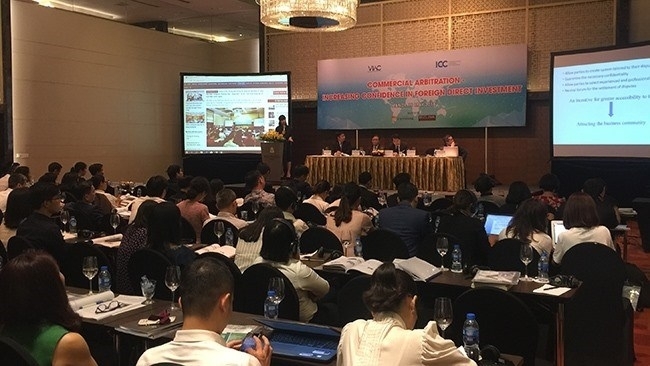 Speaking at a seminar, entitled, “Commercial Arbitration – Increasing Confidence in Foreign Direct Investment,” held recently in Hanoi, Dat said the FDI firms chose commercial arbitration for resolving disputes because of its effectiveness, and due to its helping them save time and costs. Meanwhile, court proceedings to settle disputes failed to meet FDI requirements when many of the judgments were unfair, causing lengthy disputes and considerable expenses for enterprises. Statistics showed that some 24 percent of disputes were resolved at VIAC and involved FDI as one of the parties. Of these, 32 percent were in the purchasing of goods, 24 percent in construction and 20 percent in leasing. “More than a half of commercial arbitration cases at VIAC are resolved in foreign languages (mainly English),” he said, adding that the rate of disputes in the country has been on the rise in the last three years. Vu Anh Duong, VIAC’s secretary general, said Vietnam has been considered one of the countries with high and stable economic growth in the region and the world. One of the reasons for the significant momentum for this growth was FDI activities in Vietnam. Phạm Mạnh Dũng, VIAC’s arbitrator and a lawyer from Rajah and Tann LCT Lawyers Company Limited, said that by the end of 2017, Vietnam had 24,700 FDI projects with total registered capital of US$318.7 billion, accounting for 25 percent of the total investment in the country and more than half of the nation’s total industrial production value. Dung noted that FDI has had a large impact on Vietnam’s integration into the world economy. “This has been an important factor for the country’s infrastructure development and in completing legal systems to develop market mechanisms that are suitable with international norms,” he said. VIAC has striven to become a trusted address to resolve disputes, thus helping ensure the rights and benefits of investors seeking to invest in Vietnam. Commercial arbitration in Vietnam has been increasingly developed to become a useful tool for foreign investors in the country. Disputes in investment activities have many mechanisms for resolving conflicts, such as courts, commercial arbitration and foreign affairs. However, the courts have not been an attractive solution, while resolving disputes through foreign affair mechanisms have been used in certain cases. Commercial arbitration and investment arbitration have been mostly preferred. The dispute resolving mechanisms of commercial arbitration also faced challenges, said Fan Mingchao, Regional Director of Arbitration and ADR for North Asia at the International Chamber of Commerce. He said the majority of challenges were concerning competitiveness, as the scale of disputes become larger and more complicated, resulting in prolonged time, which reduces its effectiveness. The issues relating to security and transparency of arbitration procedures have also been a problem. Security is a core feature of international arbitration, but transparency requirements are also increasingly high. In order to address this issue, agencies have approved and joined the transparency framework of the United Nations, he said. The benefit has also been seen in commercial arbitration. He said that governments should build a transparent arbitration procedure to control the quality of arbitration decisions. The seminar focused on discussing the necessity and efficiency of commercial arbitration methods as one of the most effective ways of resolving disputes related to FDI enterprises. The seminar is divided into three sessions, with discussions on topics, such as: An update on the situation of commercial arbitration in Vietnam and around the world; Commercial Arbitration - A new element worth noting to attract foreign direct investment; Commercial arbitrage as a useful tool for controlling business risks. The event is considered to be an important forum for lawyers and leading experts to share knowledge with enterprises and help Vietnamese enterprises to better understand and more effectively use commercial arbitration methods. Commercial arbitration is an effective tool in preserving capital inflows from legal risks in business investments. More than 100 delegates from FDI enterprises, counterpart enterprises, potential partners with FDI enterprises, many prestigious lawyers, and representatives from State management agencies attended the seminar.